The wife had been dying to see this film, I however was not. As I have learned in my growing tenure as a married man, she got her way and we ended up borrowing Enchanted from her folks. The only saving grace for my during this film was the fact that I had received my Nintendo DS back from my mother, who had borrowed it from me "for my dad", and subsequently became more addicted to Brain Age and Sudoku than Limbaugh to Oxycontin. 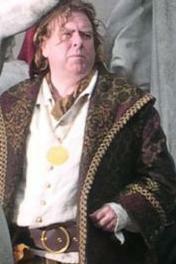 Enchanted's only saving grace was that Timothy Spall, Peter Pettigrew in the Harry Potter films, had a significant role as the the evil queen's right hand. I love that actor, he makes me want to punch him in the face in every role he plays. I give this film a swift kick in the mouse balls and recommend stapling your eyelids closed if forced to sit through it.